What if Voldemort drank a love potion? Would it have an effect on him? An interesting question that can really only be answered with speculation. I'm gonna say not much for two reasons. It seems hard to imagine him feeling anything so human as infatuation. 'I regret it,' said Voldemort coldly. He turned away; there was no sadness in him, no remorse. Most importantly of all, I feel, he operates alone. Always. He does not love, he does not trust, he does not value others. As I hinted at above, then, love potions do not create love, they create infatuation. I doubt Tom Riddle is capable of that, but he is certainly capable of obsession. Perhaps, then, the love potion bypasses the soul and one's character and nature, and goes straight to the head. Might not its magic work just the same on even one so mutilated as Tom Marvolo Riddle? He shows himself, in my analysis of him anyway, to be strong-minded. In his years as less than a ghost, hidden in the forests of Albania, he was very strong-willed. He was always going to come back, Dumbledore knew it. He pursued immortality relentlessly, going to the most extreme lengths. I have always considered the character of Voldemort to have a powerful mind. I judge him capable of overcoming a love potion and I judge his mind to be not readily diverted or captured by tricks and potions. The scream of rage, of denial, left him as if it were a stranger's: he was crazed, frenzied, it could not be true, it was impossible, nobody had ever known: how was it possible that the boy could have discovered his secret? Perhaps, then, there are means by which a love potion could work on him, particularly if it was out of date. I myself, however, cannot conceive of Lord Voldemort feeling "a powerful infatuation or obsession" with anything other than himself, "most important and precious." I agree that this is an interesting question. I also agree that it is part speculation, but we can draw some conclusions from evidence in the books/movies. I'm going to try and break it down as best I can. The first thing that needs to be considered is whether or not it would have any affect on him at all purely from the standpoint of whether or not it is powerful enough magically. What I mean by this is that arguably the most powerful wizard to ever live would have resistance to magic due to his skill as a magician. For example if a first year student cast stupefy at Voldemort would it render him unconscious? It's not like it's a bullet coming out of a gun. Each magical item, potion, or spell is only so powerful. I'm not sure that simply giving any potion to somebody as powerful as Voldemort would have the same effect as giving it to a muggle or a magician who is less powerful. If we get past the power of Voldemort and just say yes that a love potion or potions in general would affect everyone the same and there's no resistance naturally to them the more powerful you get, then the answer is it absolutely would work on Voldemort. Tom Riddle Sr. immediately left her, never to return, and never checked back to see what had become of his child or ex-wife. Albus Dumbledore: "Can you not think of any measure Merope could have taken to make Tom Riddle forget his Muggle companion, and fall in love with her instead?" Harry Potter: "The Imperius Curse? Or a love potion?" Albus Dumbledore: "Very good. Personally, I am inclined to think that she used a love potion. I am sure it would have seemed more romantic to her, and I do not think it would have been very difficult, some hot day, when Riddle was riding alone, to persuade him to take a drink of water." So you see not only did Tom Riddle Sr. get married to Merope but he left a wife he already had. There is nothing real about a love potion. It's not dependent on a person's feelings, it's a completely falsified feeling generated by the potion. Tom Riddle Sr. didn't like Merope. He immediately fell for her, then as soon as she released him, he took off as quickly as he could. If he had any feelings for her at all he would have at least tried to help with the child. But it appears he almost loathed her for what she had done to him. Dumbledore: "Tom Riddle left her while she was still pregnant... I believe that Merope, who was deeply in love with her husband, could not bear to continue enslaving him by magical means. I believe that she made the choice to stop giving him the potion. Perhaps, besotted as she was, she had convinced herself that he would by now have fallen in love with her in return. Perhaps she thought he would stay for the baby's sake. If so, she was wrong on both counts. He left her, never saw her again, and never troubled to discover what became of his son." His own personal feelings, the depth of his character, his emotional stability, etc. were completely irrelevant in regards to the effects of the potion. The potion took over all of this for him and created a false sense of love. So if you believe that Voldemort can be subjected to potion's of this nature and that they are powerful enough to subdue him then his personality, range of emotions shown, or emotional stability have nothing to do with whether the potion would work or not, it would work just like on any other person. So the only thing in my opinion left to answer is whether or not you believe these sorts of potions would work on Voldemort. There is precedent that it would. Snape: "Three drops of this and even You-Know-Who himself would spill out his darkest secrets. The use of it on a student is — regrettably — forbidden." Snape is referring to Veritaserum (truth serum), and although it is not the same potion, we do have Snape who is a potions master, one of the most powerful wizards of his time, and someone who knew Voldemort maybe better than anyone stating that Voldemort is susceptible to potions. It's up to you to decide if a love potion is as strong as Veritaserum and I would have to say that the evidence points to it working on him. "Wormtail was able to follow the instructions I gave him, which would return me to a rudimentary, weak body of my own, a body I would be able to inhabit while awaiting the essential ingredients for true rebirth... a spell or two of my own invention... a little help from my dear Nagini," Voldemort's red eyes fell upon the continually circling snake, "a potion concocted from unicorn blood, and the snake venom Nagini provided... I was soon returned to an almost human form, and strong enough to travel." Now getting Voldemort to gulp some down without knowing what it is...is another matter all together. 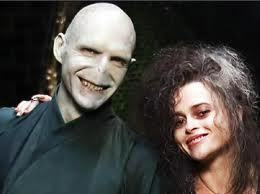 Voldemort can't feel love, but he can certainly become obsessed. Consider, for example, his single-minded pursuit of the Elder Wand, once he became aware of it. For that matter, his feelings towards Harry amount to an obsession, albeit a negative one. Voldemort's response would likely not be one a normal person would easily recognize as "love". He might imprison the target, to ensure she cannot leave. He might not allow her to interact with anyone other than him. (Sadly, such behaviour is not without real-world precedent.) He might kill anyone she has ever had any affection for, or that has ever had any affection for her, so that he is the only living person she can care about. I doubt that he would express physical affection for her in any normal way, but he might well torture her --- just to show his devotion, you understand. I'm sorry to say that this is also not without real-world precedent. That's assuming, of course, that anyone managed to dose him in the first place. He seems paranoid enough to be very careful about what he eats and drinks, and he might well be powerful enough to sense the presence of a potion, regardless of how well it was hidden. He would undoubtedly kill anyone he caught attempting it. Either way, it probably wouldn't be a good idea. Not the answer you're looking for? Browse other questions tagged harry-potter voldemort potions or ask your own question. What does the rudimentary body potion do to you? How Did Voldemort Drink the Regenerative Potion Without a Body? Did Merope's love potion have anything to do with the fact that Voldemort doesn't love? What would happen if you used a dead person's hair in Polyjuice Potion? Did Merope's love potion predetermine Tom's moral alignment?